Choose “Literacy Lovers” from the “Use this donation for” select menu. Where: The comfort of your very own home! What is the Stay at Home and Read Gala? Instead of spending money for a gala, please join us for the Peekskill Rotary’s only fundraising ball where the chairs are overstuffed and comfy, you’re cuddled up in your pajamas and don’t have to leave home! 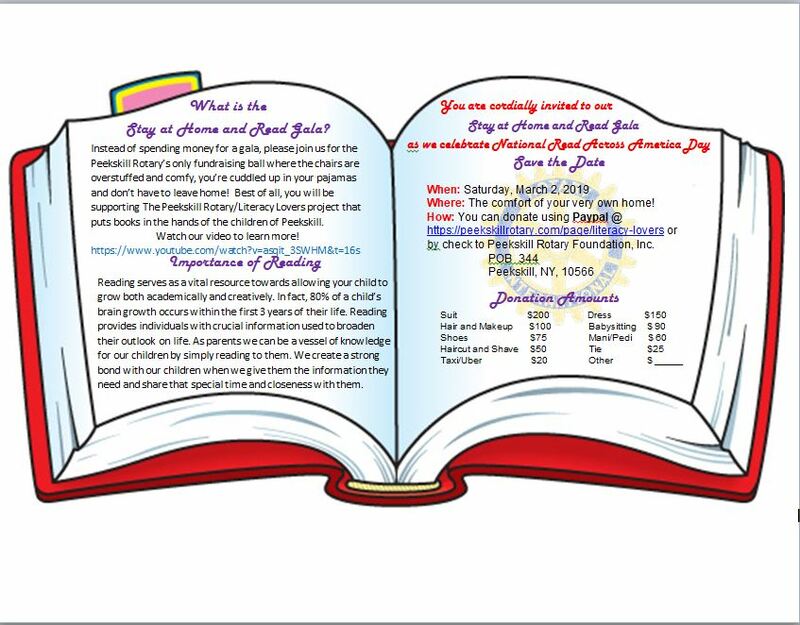 Best of all, you will be supporting The Peekskill Rotary/Literacy Lovers project that puts books in the hands of the children of Peekskill. Reading serves as a vital resource towards allowing your child to grow both academically and creatively. In fact, 80% of a child’s brain growth occurs within the first 3 years of their life. Reading provides individuals with crucial information used to broaden their outlook on life. As parents we can be a vessel of knowledge for our children by simply reading to them. We create a strong bond with our children when we give them the information they need and share that special time and closeness with them. Choose “Literacy Lovers” from the “Use this donation for” select menu on the PayPal checkout.